The Stamp Review Crew brings you the Lemon Zest Stamp Set! I decided since I was given lemons, I needed to make some lemonade! So I incorporated the Jar of Love Stamp Set and Everyday Jars framelits dies to create a country glass of fresh lemonade! They are the perfect match! Cut a piece of Pineapple Punch Designer Series Paper & Shimmery White Cardstock to 3 1/2″ x 4 3/4″. Using an Aqua Painter, add a watercolor wash background of Pineapple Punch. Adhere both pieces as shown with Stampin’ Dimensionals. Stamp the lemon slice and full lemon image in Pineapple Punch Ink onto Shimmery White Cardstock. Blend the color with an Aqua Painter. Snip the lemon slice to create one large and two small wedges. Stamp the Jar Image in StazOn onto Vellum Cardstock. Crop it with the coordinating die and a Big Shot. Crop a straw using the die and Pineapple Punch Designer Series Paper. Adhere the large lemon wedge, a small lemon wedge, straw and the two jar pieces together with Snail adhesive. Tip: only place adhesive around the edge of the jar so that it does not show through the vellum. Stamp the Happy Birthday sentiment in Versamark on Basic Black Cardstock. 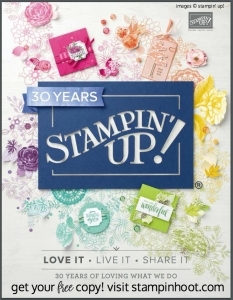 Cover with Whisper White Stampin’ Emboss Powder, set with a Heat Tool. Snip to size with a Paper Snips and adhere with Snail Adhesive. Vellum Cardstock is a must have in your craft supplies. It works well to portray the look of glass so I used it to help me create the depth of the lemonade and to make it look like the lemon and straw were inside. Make sure to use StazOn, it stamps and dries best when using Vellum! Stamping sentiment on Black Cardstock and embossing them with White Embossing Powder really makes them stand out and pop off the card! Yellow and black work so well together! Cute, cute use of this stamp set with the Jar of Love! Jars are perfect for serving lemonade! I love your lemonade jar! So fresh and summery! Super cute card, Stesha! Great use of that Mason jar! Looks good enough to drink! Love your lemonade card – too cute. Lemonade in a Mason jar – it doesn’t get more “summer” than that! Love it! Nothing says Summer better than a mason jar of lemonade! What a cute card, Stesha! Very clever design. Love that you put the lemon slice on the jar! Perfect! Oh what a stunner Stesha. Such a fun, fresh and vibrant card. Yes, this card is perfect! That is absolutely darling! I love the whole color scheme and the perfection! MMM MMM MMM! Now I need a quart jar of lemonade. Beautiful card.